TN Bass Nation High School Championship will be on Douglas Lake, Dandridge TN, May 3-4, 2019! Glenmore Mansion will be hosting its annual Spring Garden Market on Saturday, May 4, from 9am - 2pm. There will be venders with flowers, vegetable plants, and other garden items. Also there will be strawberries for sale, strawberry shortcake, entertainment, live music, and guided tours of the mansion. Lunch will be available in the Tea Time Tent. The TN Bass Federation State Tournament - East Division will be on Douglas Lake, Dandridge, TN, May 10 & 11, 2019. The White Pine Marine Trail returns to Douglas Lake on May 11, 2019 at the TWRA Shady Grove Boat Launch, Dandridge, TN. Visit Jefferson County for the 6th Annual Lakeside of the Smokies Triathlon in Dandridge, TN. FREE CONCERT hosted by Mossy Creek Foundation featuring The Lost Creek Band as the series opener! Gather up your lawn chairs or a blanket—and your friends—and make your way downtown for a night of great entertainment. Come hungry! Food trucks onsite. The White Pine Marine Trail returns to Douglas Lake on April 6, 2019. FREE CONCERT hosted by Mossy Creek Foundation featuring HillBilly Bonez as the series opener! Gather up your lawn chairs or a blanket—and your friends—and make your way downtown for a night of great entertainment. Come hungry! Food trucks onsite. Gather up your lawn chairs or a blanket—and your friends—and make your way downtown for a night of great entertainment. Come hungry! Food trucks onsite. ROCKIN' THE CREEK SUMMER CONCERT SERIES with the DOWNBEATS! College Street Festival Returns to Mossy Creek Station April 13, 2019! The Annual Dandridge Christmas Parade, Sponsored by Dandridge Volunteer Fire Department will be held on Saturday, December 22, 2018 starting at 1:00 PM. Step back in time and visit an Old Fashioned Christmas and take a tour the AJ & Sallie Bush Homeplace. And after you visit the open house, be sure to stop into the Bush's general store for that special gift, and the cafe will be open for lunch. The open house will be on December 13, 14, & 15 from 11:00 AM - 2:00 PM. Experience a True Victorian Christmas at the Glenmore Mansion in Jefferson City, TN. Holiday Tours will be the first and second weekends in December. Come make merry and Light the Night with the first annual NIGHTTIME PARADE in historic Downtown Jefferson City, TN. The parade begins at the Mossy Creek Station and winds its way through the community. Parade floats and participants will *sparkle* with holiday lights and glow-in-the-dark designs. You won't want to miss it! LIVE ENTERTAINMENT, GIVEAWAYS, AND FAMILY-FRIENDLY FUN - immediately following the parade at Mossy Creek Station. Details soon. 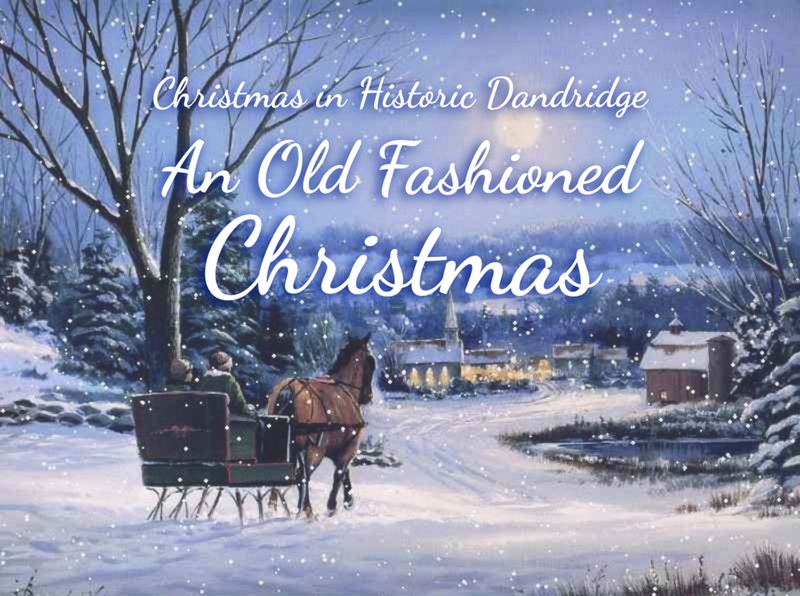 Come experience an Old Fashioned Christmas in Historic Dandridge, Tennessee. There will be Christmas Carriage Rides, Carolers, shopping specials and much more! Join us at Mossy Creek Station in the Historic Mossy Creek District, Jefferson City TN for a festive day of holiday memory-making! The old First National Bank building on E. Main Street (now called The Vault) will be transformed into a holiday shopper’s paradise. Both downstairs (handicap accessible) and upstairs will be filled with creative vendors providing you the opportunity to "shop local" for a wide variety of delightful holiday gifts. Free DIY gift wrap station onsite for your convenience. The Annual White Pine Christmas Parade hosted by the White Pine Fire Department will be on Saturday, December 1, 2018 in downtown White Pine, TN. For more information on the parade or to enter a float visit their Facebook page! The Annual Christmas Tree lighting presented by the Dandridge Ministerial Association will be held at the Historic Jefferson County, TN Courthouse on Friday, November 30, 2018 starting at 6:00 PM. Join us for this special celebration to commemorate to beginning of the Christmas Season! Morristown Marine will have their 2018 2 Day Classic Saturday November 10-11, 2018 at the Dandridge Boat Dock/ TWRA Public Boat Ramp. The 2 Day Classic Banquet will be at the Field of Dream Activity Center Thursday, November 8, 2018. White Pine Marine Trail 2018 Classic will be on Cherokee Lake at the TVA Dam Boat Ramp, Jefferson City, TN November 2-3, 2018. The Tournament Trail banquet and registration will be at Field of Dreams Activity Center, Dandridge, TN October 31, 2018. Join us for our weekly Farmer’s Market every Saturday from May 5th to October 27th! With fresh fruits and veggies, as well as local honey and more, you won’t want to miss this! Morristown Marine Trail will be on Douglas Lake at the Dandridge Boat Dock/ TWRA Public Boat Ram Saturday, October 20, 2018. Join us in Dandridge, TN for a concert series behind town hall! Celebrating the area's earliest settlers, the Annual Scots-Irish Festival will return September 29th, 2018 to Historic Downtown Dandridge, TN on the shores of Loch Douglas in the foothills of the Smoky Mountains. Come experience pipe bands, Celtic entertainers, Highland games, dance competitions, food, merchandise, and much more. You may enter yourself in the text system for this event by texting the word douglas to the number 25827. We will enter your number in the system but some carriers block these type of messages so by entering yourself, this will prevent the chance of being blocked. Also if you have previously opted out of our system, you will have to put yourself back in the system by texting the above keyword. If you opt out we cannot put you back in the system. Entry fees are per angler. If you have previously registered/paid online then you have an official entry into the tournament and are NOT required to attend the registration on Friday. Friday's registration is ONLY for anglers who have not already entered/paid for the tournament. *If you qualified to receive an early online entry rod (see below). Due to the varying times of year that we host our tournaments, we will notify everyone of the start time on the Friday before the tournament. We will notify you via text message and/or email. Start time (first cast) for each tournament will be safe light and set by the tournament director. You may launch and be on the water but you may not begin fishing until we notify you of first cast. Please do not call our offices related to start time.